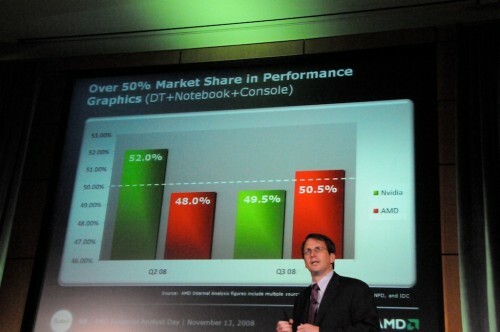 ( I’m at AMD’s Sunnyvale headquarters where I expect the company to announce its netbook strategy. 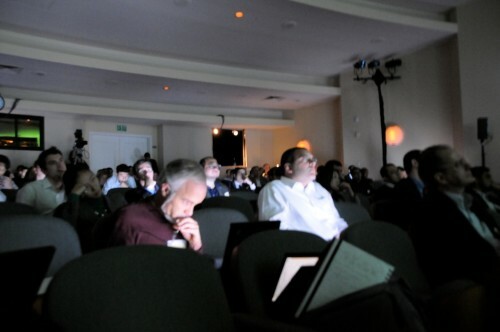 We’ve been listening to execs toalk about the big picture. 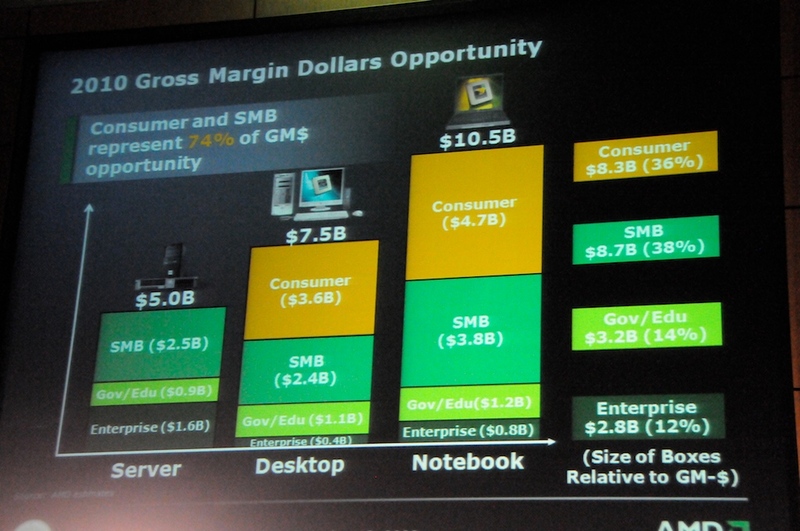 The company is going to focus on mainstream products for consomers and the SMB space since AMD believes they hold most of the profit potential in the notebook market. The room is packed with a lot of financial analysts (duh) and AMD employees There are a lot of serious faces in the room, probably because Intel announced that it chopped its sales forecast by a billion bucks for the quarter. 9:27: There’s an HP rep and AMD guy on stage now talking about servers, virtualization and Shanghai (AMD’s server processor), which isn’t increadibly interesting to me. 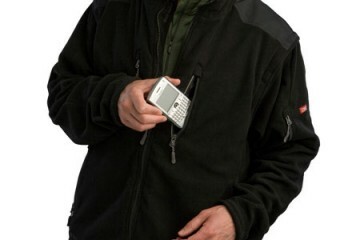 Where’s my netbooks? Ali from Sun Microsystems is on stage now talking about how they use AMD processors in their servers. Love fest between Shanghai, Sun, Solaris and its customers. Dell and IBM couldn’t send someone here to talk about servers, so we’re running through some canned videos now. Ok…we get it…all of AMD’s customers and partners love AMD. 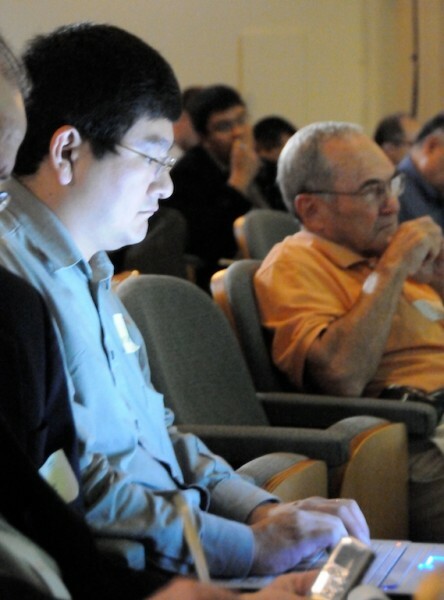 I think people are getting bored of this part of the presentation. In fact I just caught a couple of people falling asleep behind me. 9:44: Another canned video- this one’s from Microsoft- talking about virtualization. 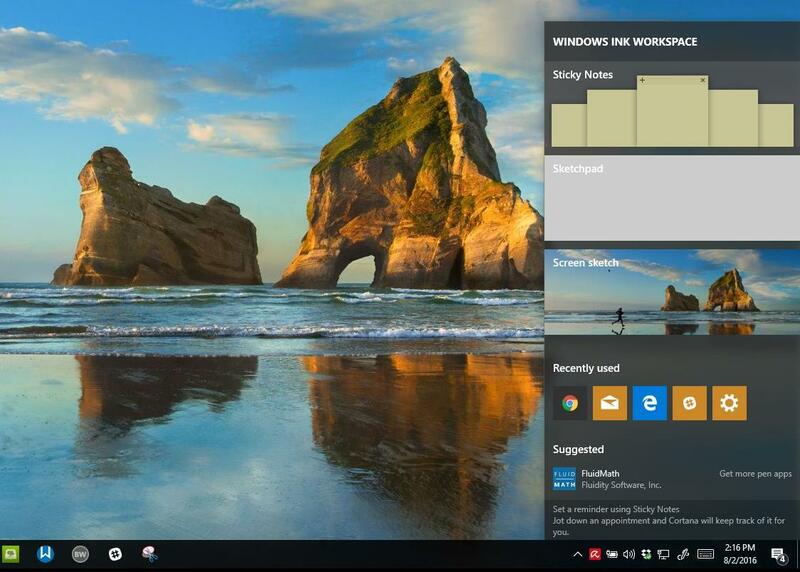 There’s a shift of wanting uncompromiced PC experience at an increased power efficiency. 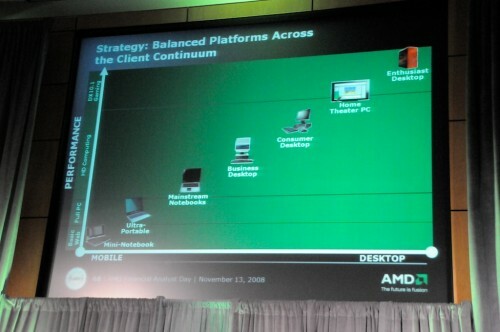 Here’s a chart of how AMD views mobility compared to performance. AMD is introducing a platform called Yukon 1H09, that will deliver a full PC experience. Q1 or Q2 of 2009. 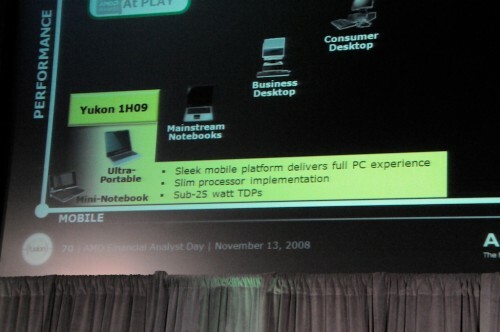 Yukon will have a 25w TDP and offer a “full PC experience.” As expected there is no OEM partnership announcements. Tigris is the new mainstream notebook platform. Randy is reminding everyone that the largest profit pool is in mainstream client and that the high-performance market is relatively limited. 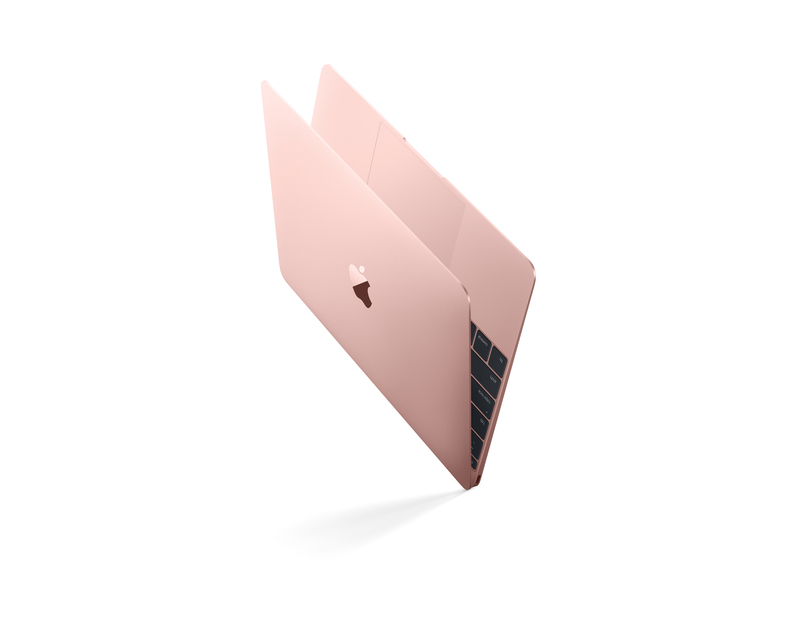 They’re also promising to deliver these products on time and better than promised. Coffee break. 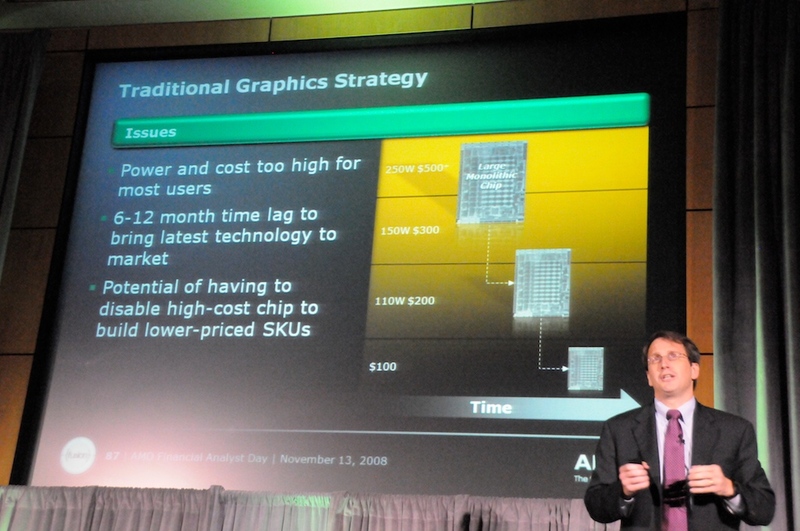 AMD says it’s going to continue developing graphics products for the mainstream consumer. They’re showing off reviews from Maximum PC, Hot Hardware and others, but you can’t take reviews to the bank.AMD says NVIDIA spends too much time and $$$ building graphics solutions in the high end and ignore the middle market (I don’t completely agree with this, but it sounds like AMD/ATI is gaining in the desktop graphics space. Some interesting numbers about notebook graphics: 88% of notebooks sold at retail come with integrated graphics. No wonder why som many people complain about games “not working” on their notebooks. This is one of the reasons why I recommend people build customized notebooks online or over the phone instead of buying from Best Buy or Circuit City if they want high performance. 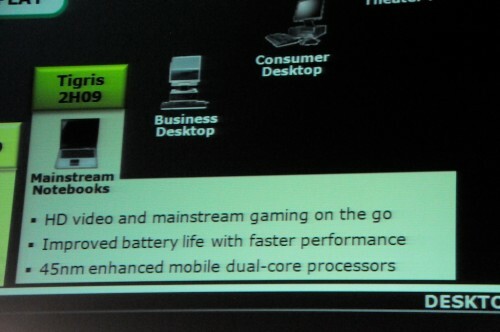 AMD claims it’s the leader in graphic processing graphics units if you count desktop+notebook+gaming consoles. Take away gaming consoles like the Wii and NVIDIA’s the market leader. AMD says video transcoding w/Radeon technology is cheaper and faster. AMD is going to start going after the professional graphics marketplace. AMD doesn’t play in the workstation space right now, but it makes up 15% of the GPU market. They’re going after it. 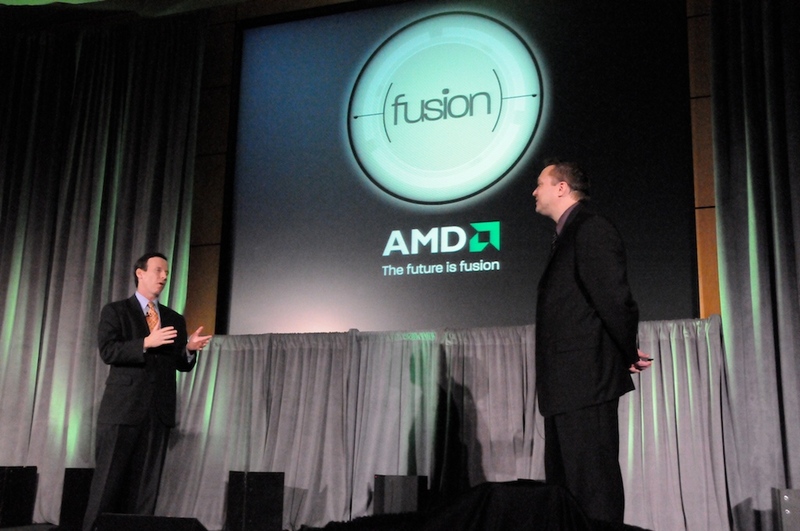 11:00AM: The Foundry Company guys are talking about what the split from AMD means to shareholders…yawn…. 11:20AM: looking around the room I see several other tech bloggers. 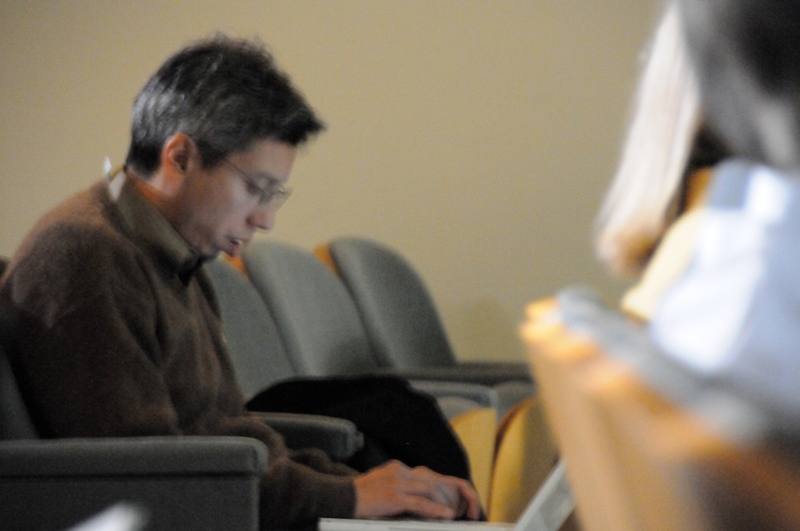 This is Dean Takahashi of VentureBeat– he’s using a 15.4-inch Acer Aspire (can’t tell exactly what model from where I’m sitting). And this is Jean Baptiste Su of UberPulse. 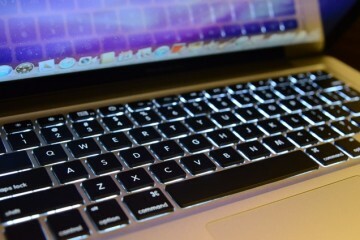 He’s using a white MacBook as usual. AMD Says Yukon will be more affordable, thinner so it can fit in thiner netbooks. “Atom is targeting markets we’re not even go after” People don’t want a compromised experience. Will not be going as low as Atom is going. 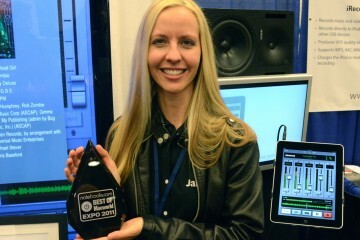 It will have both a processor and graphics solution..
1:30PM: I’m in a session with Bahr Mahoney. 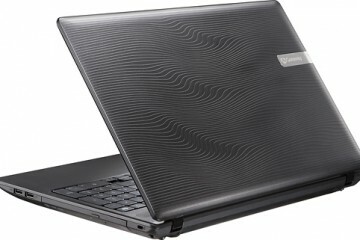 He just told me that AMD is not going after the low end of the mini notebook (netbook) market. 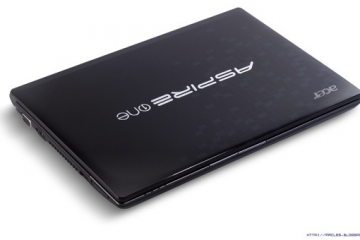 He says the volume is dramatically in favor of netbooks that are closer in performance to the mainstream notebook market. 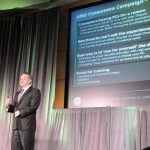 AMD will steer clear of the enterprise business notebook market in part because “We don’t offer the ultimate in the battery life that some of the enterprise customers are looking for in enterprise ulramobiles,” said Mahoney. Ammmmm waiting for the netbook platform info??? I hope today is the day!!! 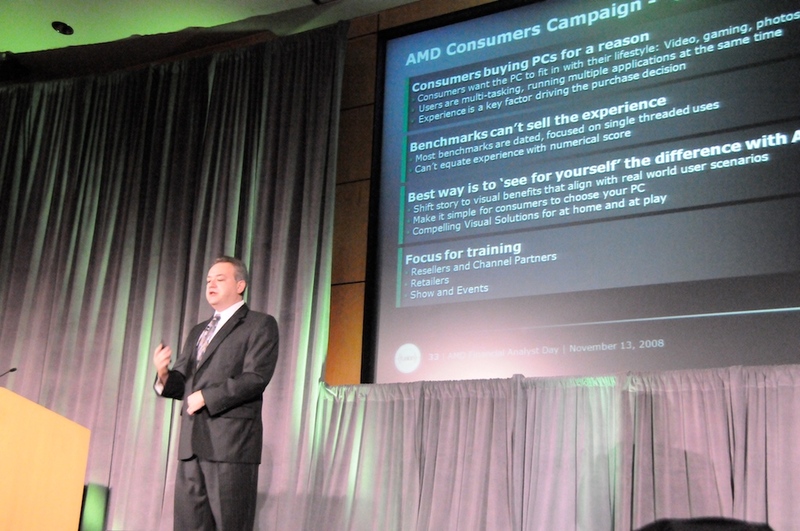 The head liar for AMD, Moorhead, spent the past 2-3 months trying to tell people that customers dont know what they want, AMD does. Of course, when you’ve missed the boat and are the only manufacturer who isnt involved, people might think that sour grapes are the reason. 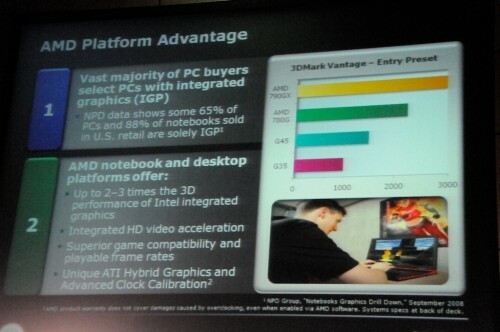 Asus and Acer cant makes them fast enough but AMD knows better than them and the customers.